Chantelle Purcell talks to Annabel Tilley to find out about the current exhibition ‘Home’ at Core Gallery, which is co-curated by Annabel Tilley and Rosalind Davis. Home features the work of 12 contemporary and internationally acclaimed artists who explore the question: What does home mean today? The concept of home has become a widespread subject of increasing tension in the 21st Century, affecting all aspects of society and identity. Home is no longer a safe word but a loaded word and a delicate place, vulnerable to attack – both globally, financially and intimately. In this interview we find out about the motivations and curatorial development of this exhibition. We talk about the resurgence in drawing over the past decade and the potentials of contemporary drawing practice we also discover more about Annabel’s practice. ‘Home’ has been extended to this months Last Fridays in association with South London Art Map where Core will also be holding a closing party (as they will be relocating to a space in Deptford). CP: Can you tell me more about the current exhibition ‘Home’ at Core Gallery? AT: The idea for the exhibition came to me in two ways. 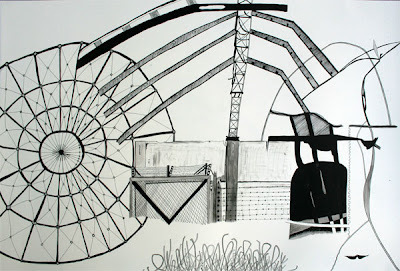 The first was when I visited the 2010 Jerwood Drawing Prize and I noticed a drawing by artist, Lucy Austin, entitled: A Machine for Cleaning my House. 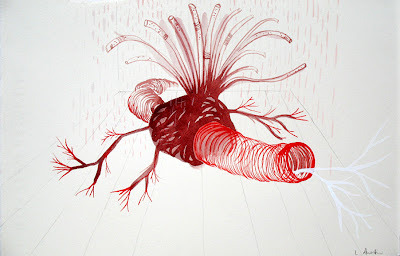 This red watercolour of a surreal phallic shaped, feather duster-like object fascinated me. A week or so later I had a tutorial at Core Gallery with British artist, Graham Crowley, and critiquing my work, he suggested that in subject matter I might consider moving ‘closer to home’. And in that moment something clicked in my mind and, almost immediately, I approached Rosalind Davis and asked her if she wanted to co-curate an exhibition on the theme of home. CP: How did you go about selecting each of the artists? And how does their work respond to the very loaded ‘concept of home’? We chose artists whose work we knew and liked but who made work that had some connection to our combined notion of Home and that, often in some form, celebrated or subverted the idea of the domestic. For instance I chose Lucy Austin because her drawing not only ridiculed the idea of the domestic machine but was also referencing a darker subject altogether, the self. 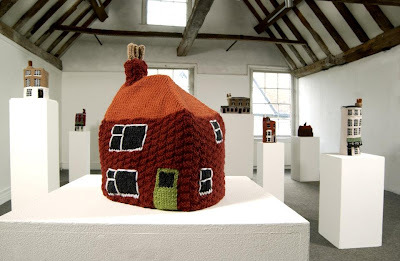 RD suggested Freddie Robins for her wry and perverse work Knitted Homes of Crime, which, literally, features a collection of knitted homes – of infamous female murderers. Rose Wylie was a natural choice for me, as she had once shown me a collection of obsessive watercolour drawings of the many brick surfaces in her own home. Carolyn Lefley’s photographs appealed to both of us but led to different and interesting choices. 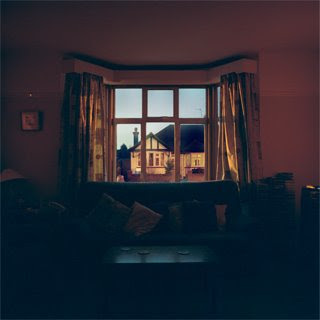 I was drawn ‘Living Room (from the series ‘Home’) an image of a dimly lit, warm, surburban sitting-room, and the safe middle-England upbringing it suggested. While Rosalind chose a larger-than life bleak image of a bare room except for an empty bed and curtains. On first sight the scale of the room is mystifying until one realises one is looking at a dolls house. For Home the artist Delaine Le Bas specially created: The World Turned Upside Down. In the Cathedral of Exotic Misery (after Kurt Schwitters). 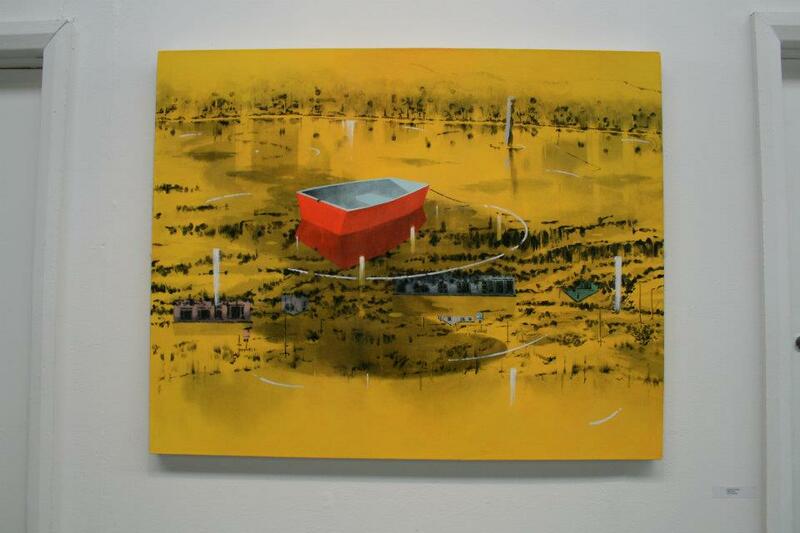 I chose Le Bas after having seen her work in the first ever Roma Pavilion at the 2007 Venice Biennale. Her installation piece features a candy-coloured, Disney-print structure with a celebratory ribboned exterior suggesting a village fete. Yet on closer inspection this tent-like structure leaves one feeling uneasy with its life-size manikin of a masked child in wellington boots surrounded by an array of discarded stuffed animals, fragile model aeroplanes and clothes with exquisite embroideries of words like FEAR. In Kate Murdoch’s Birdcage and I Don’t Suppose I’ll Ever Go There, chosen by RD, home is a domestic prison and a poignant receptacle for souvenirs, signifying other people’s holidays and the elderly recipient’s unfulfilled dreams of travel or escape. In Rich White’s installation, Not At This Address one enters a wooden labrinyth and walks forward – with trust in one’s heart – into the darkness through short, uneven corridors towards the light. Eventually one mounts a platform and comes upon a small and cosy white room with an armchair, a place to meditate, to think – a quiet place – a place called home. Rich White’s initial proposal had hinted at something more desperate, a place of refuge or escape from a difficult world. Yet what Rich White actually created is a place concerned with serious reflection, in general, but more specifically on the idea of home, and what that might be. We both chose Emily Speed’s cast plaster piece entitled: egg – nest – home – country – universe which consisted of a group of slightly larger than life-sized eggs [I am guessing Duck eggs!] 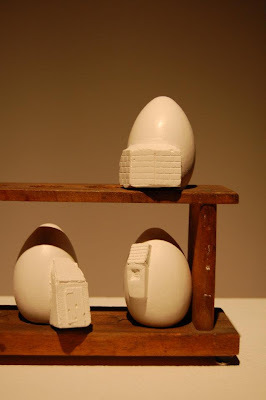 each with a fantastical miniature type of home cast onto the side. Meanwhile RD chose Peter Davis’s evocative and exquisite hand carved figures of women – Standing Woman & Seated Woman which, for me, can’t help but suggest the continued cultural dominance of the woman as central to the idea or memory of home. We felt very privileged that RD was able to borrow several old and new works from the British painter, Graham Crowley, particularly his lyrical landscape, Yellowdrift and the huge but infinitely graceful black and white oil painting of flowers arranged in a vase. 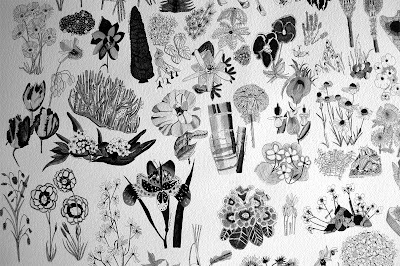 RD suggested that I include my large-scale drawing Rememberance of plants past (extracts from: The Encyclopaedia of Plant Portraits, compiled by A. G. L. Hellyer, 1953). 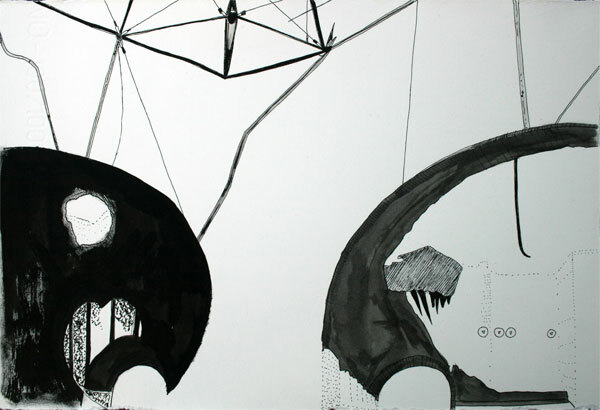 This monochrome ink-on-paper drawing is based on images from Hellyer’s book, and considers a world that was once reflected back to us in black and white, be that originally television, newspapers, books or photographs. Hellyer’s book was a best-seller for over a decade and would have been on the bookshelves or coffee tables of many homes in the fifties and sixties. CP: Can you tell us more about the curatorial working process between yourself and Rosalind Davis? It became apparent, early on that we would take different approaches and this provided a vital tension in our relationship as co-curators. It meant nothing was taken for granted, and that each artist and piece of work had to win their place on merit, including on the publicity and private view cards. I really enjoyed that debate and dialogue and it meant each of us stuck out for what we believed would create a good overerall show, rather than just championing the individual artists we wanted to work include. Rosalind is highly intelligent, and quick-witted and kept me on my toes. We didn’t know each other very well when we began but it’s been a fascinating and wholly pleasurable journey, where I feel I have been stretched to consider an old subject in a new way. Rosalind and I are at different stages in our lives, and I think our approach to the subject, and the work suggested, is a reflection of that. For instance, I was thinking more literally about the home, as a domestic space that we are born, grow up, live in as adults, often with partners & families, whereas, Rosalind took a more metaphorical approach and considered the bigger picture. I believe this has led to an interesting balance between the intimate and the grandiose, the fantastic and the poignant. CP: Do you think the notion of home as a safe and congenial space exists within this current climate? Is this exhibition a hybrid or conflict between old and new ideals of the home? And what does home mean today? I do believe ‘the notion of home as a safe and congenial space exists today’, has always existed, and will continue to exist. In fact I believe whether as a desired domestic space or the idea of a safe mental space, this is what we are all searching for. And that that search is encapsulated by the age-old question first posed by the Greeks: How should we live? 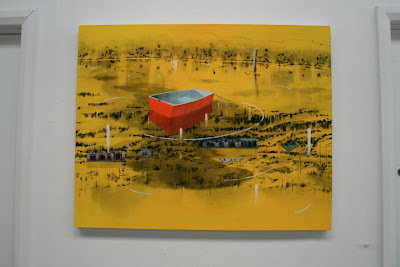 However, in another sense, in a difficult financial climate or a world challenged by natural disasters, as Rosalind makes clear in her own paintings, people are very susceptible to losing their physical homes. What is also noticeable today is also an emphasis on streamlined style – the IKEA-factor – one might call it, where the interior of houses often look similar and bland. You buy into a designed style rather than creating it yourself. The eclectic look of many disparate objects coming together in one room, new and old, antique and modern etc, seems to be rare. This was obvious to me looking at my own adolescent and deadpan work: Silent but for a clock-ticking, 1977. A black and white photograph of the family sitting-room in our West London flat; where the appearance gives the impression of a group of eclectic objects collected over a long period of time. I think the conflict is very apparent if you compare that work with say, Carolyn Lefley’s colour photograph Living Room (from the series ‘Home’). I am not sure there is one answer to that question: What does home mean today? Because the exhibition, and our thinking around it, has created a whole myriad of possibilities. My instinctual response would be that home is a place buried deep inside all of us; it is also a profound place of memory in our childhood, and remains a current place of abode – I like to think of home as a happy place, and a space where you can be yourself – neither of these statements applied to my rather privileged & bohemian yet ungoverned & chaotic childhood where my sister and I grew up to be ‘seen but not heard’. CP: How did you curatorially approach the space of the gallery, to create a sense of place? At one point I suggested we quite literally create the idea of someone’s flat in the space, with a front door and furniture etc. But we quickly rejected this idea as impractical, and perhaps, gimmicky. However, it is possible to see the space as like a corridor in a house, where you hang work next to each other for aesthetic as well as practical reasons. The exhibition was also built round the knowledge we would have at least two large works, one obvious and exposed, the Delaine Le Bas installation and another, by Rich White, invisible and hidden. CP: In the essay ‘The Inexorable Rise of Drawing’ in Issue 6 of Garageland, you discuss the resurgence of drawing in the past decade. What revelations have been made within contemporary thinking of ‘drawing practice’ and what potentials have you found from working within this discipline? The main revelation in the last decade with the arrival of exhibition spaces like The Drawing Room and Andrew Hewish’s Centre For Recent Drawing is that drawing is, indeed, now regarded as a practice in its own right. In some ways it always has been but often, in monetary & art-world status terms it has been forced to be seen as the poor relation of its big-macho-brother painting [but, I hasten to add rarely in intellectual or aesthetic terms, and among artists, certainly drawing is seen as a sophisticated tool for conveying ideas and feelings, if not shapes & colours!]. I see the second revelation as being about the idea of defining drawing, and what it might be. I believe competitions like The Jerwood Drawing Prize have contributed to this debate as did some of the original drawing degrees and MAs that were available, but have now been replaced, due to financial constraints, by the all-encomposing bland term: Fine Art, which by its very breadth ceases to pose the once exciting and specific question: What is drawing? 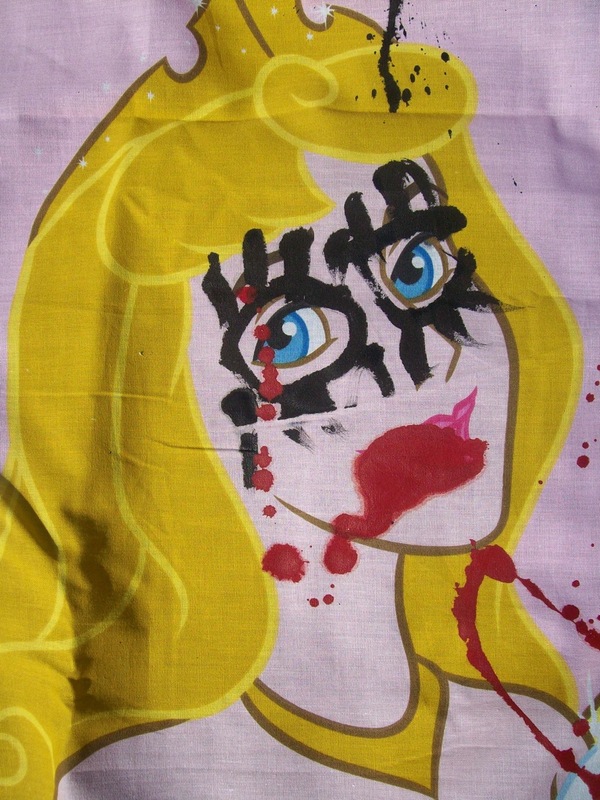 Of course, drawing can be anything one wants to use a single leap of imagination to define, as such. 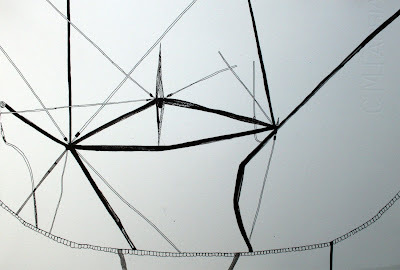 However, for myself, I am more interested in how traditional practices of drawing can be used to convey contemporary and conceptual ideas, often by inverting the subject matter and questioning people’s preconceptions or by simply re-emphasising the mundane, the everyday, so we look at our world a new. Living artists I particularly admire for their drawing are: Kiki Smith, Rose Wylie, Tracey Emin, Marlene Dumas, Adam Dant, Claude Heath, Rachel Goodyear, Susan Collis, David Hockney, Emma Stibbon, Heather Deedman and Lucy Austin. Dead artists I look at, all the time are: Joseph Beuys, Leonardo da Vinci, William Blake, John Ruskin & Thomas Bewick [Oh dear, nearly all men!] and I forgot the great, and dearly lamented, Louise Bourgeoise – amazing drawings that just make you want to draw. CP: Curator Audrey Yeo states that your work is ‘a poetic aesthetic of time that also shows a reverence for history.’ How do you bring a contemporary twist to these objects of the past? And what new insight can we learn about the present through history and vice versa? In my drawing practice I like to use traditional paper-based forms of drawing such as pencil and ink on paper, and my desired intention is to explore contemporary ideas. These often include the use of archive images. For instance, I recently took part in LONDON/BERLIN – a group show, curated by Andrew Hewish of London’s Centre For Recent Drawing, that explored contemporary drawing in those two cities. Andrew asked me to create a wall drawing based on motifs from the old GDR. I chose architecture and worked with the sublime East Berlin archive photographs of Gisela Stappenbeck. I allowed myself to let go of my literal tendencies, and worked purely from the emerging patterns, and repetitions I found in her photographs. I recreated the structures as individual motifs. The idea of drawing straight onto a wall in a gallery was a new venture for me but far from suffering the anxiety I had feared. I found the experience of creating something that would later be painted over, rather liberating. It caused me to work harder, and create even more elaborate detail, and as I did so a shakey, hand-drawn remnant of the once-held GDR socialist dream appeared in pattern-form on the wall, 50 years after the Berlin Wall was built amid barbed wire, guns and tanks, and 21 years after peace demonstrations caused it finally vanquished torn down. However, I do not think of my work as in any way political, or commenting on current or past political maneouvres. Rememberance of plants past (extracts from: The Encyclopaedia of Plant Portraits, compiled by A. G. L. Hellyer, 1953). is, as I said earlier based on images from Hellyer’s book, and considers a world that was once reflected back to us in black and white, In post-war Britain the use of colour was expensive, and thus rare. Colour denoted luxury. Today colour is taken for granted and b/w images are, ironically, rare and often used to create a stylised statement. In Hellyer’s mass-produced: Encyclopaedia of Plant Portraits from the 1950’s each plant is photographed individually in b/w. The book allows no sense of scale, so a type of democracy is imposed on the plant world where everything appears a similar size, and in comparable tones of b/w. Nothing appears bigger or better. Only a plants individual structure stands out. I have taken that idea literally and reinvented the monochrome images as hand-drawn individual motifs, emphasising their distinct structure and pattern. Yet taken as a whole, the overwhelming effect could be a printed wallpaper. Indeed, the drawing is presented unframed on a roll of Fabriano paper which rests on the floor beneath. The process of making this drawing has made me realise I have become interested not only in the way that our world was once reflected back to us in black and white, but in the significance of these out-of-focus, blurred images that represented our world, then, as perhaps a cold, distant, disinterested, post-war, poverty-of-ideas time and place. When I draw from the photographs in Hellyer’s book, I invert what I see and recreate them as sharp, tonal, detailed almost larger-than life images but still using B/W. In my practice I love the idea of limitation, and how once one imposes such limitations, for instance: ‘I will only draw in black ink, I will only draw old photographs of plants from one book etc’ one discovers a whole new freedom within those limitations. CP: Within your work you ‘collect and source fragments of long forgotten news clippings or distorted taxonomic images.’ Presenting them in an anthropological way akin to how museums classify and present artefacts and specimens in collections. Would you say that your work is an epistemological critique on how museums / media shape our perception of culture and nature? It is quite new work so I am still trying to understand the subtext for wanting to draw from old black and white, out-of-focus photographs in mildewed books bought from Oxfam. However, I like the idea that everything used to be ‘understated’ and now everything appears to be overstated &, indeed, often overated. We live in a world that exaggerates everything, making it bigger & better, and faster and more colourful than it really is. Today we produce so many images, and so much colour and so fast that it is overwhelming and it creates an impossible-to-quench thirst of expectations. The ‘bad’ photos I work from now seem to have an integrity, they are what they are, they make no false claims, and if anything, totally under-represent the often stunning and colourful product they are ‘selling’ – flowers & plants. I like this irony. CP: You have been involved in the DIY Educate Programme at Core Gallery. Can you talk of the importance of educating and nurturing other artists? And can you tell us about the forthcoming events? Rosalind & I are passionate about this subject because, at different times, we both left art school and entered a world that seemed unhelpful and unconcerned with the plight of new graduates, and the way they might orientate themselves, through an indifferent-seeming art world. We have been hugely fortunate in 2012 to work with a great variety of artists who have been totally enthusiastic about what we are trying to do. From the young British Painter, Phoebe Unwin, RCA graduate & printmaker, Jenny Weiner, and a-n artist-talking editor, Andrew Bryant, all have made a great contribution to a programme that aims to support and encourage new graduates with practical experience straight from the horses mouth; acting as role models providing the artist’s own advice and narratives regarding the highs and lows, joys and disappointments of being an artist in Britain today. So far, so good, it has been a great success, and we will be back next year with a whole new exciting 2012 programme. And you heard it hear first. CP: Home will be the last exhibition at Core Gallery’s current space before relocating in Deptford. This exhibition therefore seems highly topical and and poignant. How do you think this will heighten the fragility of the show? Actually, the sudden wave of unexpected joy, fulfillment & pleasure that has come as a result of working with intelligent, generous, and hugely talented artists on a great and varied theme like home, makes me think you may not have seen the last of Home, or the extremely productive and pleasurable TilleyDavis partnership. Let’s end on another high! 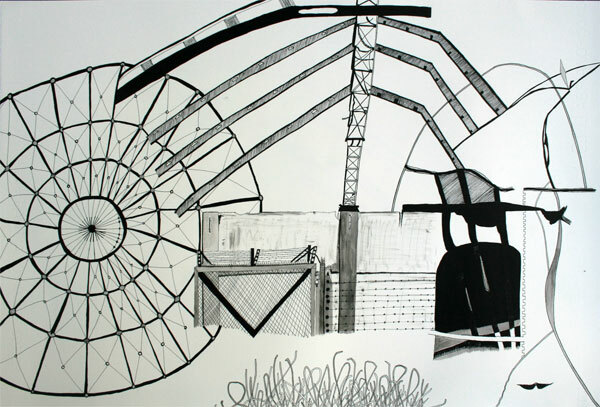 Annabel Tilley has exhibited in Britain and Europe, and was shortlisted for the Jerwood Drawing Prize in 2005. She has undertaken several residencies and public commissions, Most recently, she created a wall drawing for London/Berlin, a drawing survey exhibition curated by Andrew Hewish (C4RD, London) at Fruehsorge Contemporary Drawing in Berlin. Her work is held in private collections in Britain and France. Annabel Tilley has written for Arty Magazine and Garageland, and also writes regular reviews for a-n’s Interface, and the blog: how to emerge?. Annabel Tilley trained in Fine Art Painting at The University of Brighton, and has a studio in Deptford, South London. www.ZeitgeistArtsProjects.com ZeitgeistArtsProjects is Rosalind Davis & Annabel Tilley, the innovative partnership, behind the highly successful 2011 DIY Educate pilot programme, Show&Tell, delivered at Core Gallery ( Rosalind founded and directed Core gallery 2009-11) which included talks by artists Phoebe Unwin, Delaine Le Bas, Freddie Robins, Matt Roberts, Day+Gluckman and many more. DIY Educate is an evolving artists development and education programme run by and for artists, curators and art professionals to encourage artistic development, giving professional practice guides, inspirational talks and resources to help artists survive in an unstable and competitive climate, making the most of their skills. Our Show&Tell programme provides opportunities to learn, network, share ideas and knowledge, providing impetus to develop and sustain your practice.